“People tend to see the huge annual PLA budget increases as a threat to China’s neighbors, but to a large extent it’s a way to quell the PLA’s danger to the Communist Party.” This is true. But what worries me is an army wanting to test new toys and a bellicose public pushing for action. Japan is obviously far too important a trading partner to take on, but others in the S China Sea might find pointed aggression coming their way. Tremendous Garnaut article. Modern warfare is as much effective logistical support as advanced military hardware. Bring it on. Even the Phillipines will come out the other end looking good. Like KT, I am also a Garnaut fanboi – a real observer of Chinese affairs unlike the “China experts” who so regularly pop-up to offer sound bites. Of course, all military-industrial complexes (if one may use this term in the original sense that Eisenhower did, rather than as a catch-all left-wing sense of ‘big government that I dislike’) are subject to an element corruption because of the relative lack of accountability (without actually having to use the weapons in a war, it is often difficult to know whether they are good or not) and because of the necessity that people should move from the military to industry serving the military. Check out the history of weapon systems like the Brimstone anti-tank missile, the Bowman radio, and the Bradley AFV for examples of weapons systems that suffered from massive cost over-runs and delays inherent in the wasteful way that weapons are developed and manufacured in Britain and the US. This said, it is hard to believe that the PLA is any less corrupt than the rest of China’s state apparatus. What is unknown is the degree to which the PLA is more/less ready for war than her adversaries because of this. 1) Its relations with the UK were close enough that it was able to gain from the sharing of military technology and training. This bore fruit at battles like Tsushima where the gunnery of the Japanese outmatched that of the Russians even though the numbers were essentially the same. The Japanese fleet was mostly either built in British shipyards or in Japanese shipyards on licence, whereas the Russians had to develop and construct their entire fleet. 2) Russia at all times also had to be mindful of its other potential enemies – the Ottomans, the Austro-Hungarians, the Germans, the Franco-British – but Japan needed only to worry about one potential adversary. 3) Russia was necessarily a land power, Japan a naval one. 4) Russia was fighting in an area essentially of Japan’s choosing. 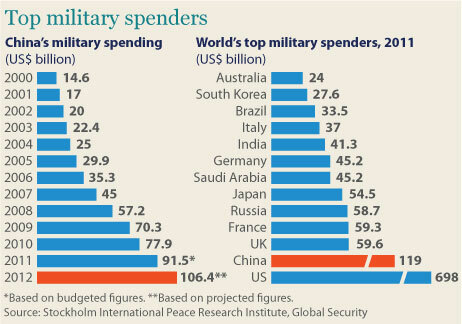 From this we can see that actually, even if the PLA is no more corrupt than the Japanese armed forces, it would take a disparity in spending much greater than that currently seen for Japan to be at a disadvantage in a naval clash. The PRC will always be distracted by problems on its borders with Vietnam, India, and Russia, keep forces sufficient to threaten Taiwan and hold down Tibet/Xinjiang. By contrast, Japan need only worry about the PRC. Japan can free-ride on R&D in advanced weaponary performed by allied states, but no major state with access to advanced weaponary will willingly share technology with the PRC. Japan need only be strong at sea and in the air to win a naval war with the PRC, but the PRC must always put its main focus on land power. PS – As an illustration of the difference between an “China expert” and an observer of Chinese affairs like Garnaut, I was recently contacted by an investor friend of mind who wanted advice on who they should look at for information on Chinese markets. I pointed him to a few people and he came back saying that they gave out too much ‘information’ and he was looking for something just to tell him where to put his money. I then asked him if he would trust a single-source ‘expert’ on the European or American markets to tell him where to put his money or would see someone handing out that kind of advice as a bit of a charlatan. In reality, the best sources give you inside information and leave the editorialising to the reader. Wonder if anyone else caught this little bit of a wink. Taiji is phonetically “Prince” in Chinese. Pinyin would likely have used Tai zhi for the ‘j’ sound. Prince, as in princeling. That was a thanks for the Garnaut link. Need to improve my tech skills.